In a recent conversation with a group of district leaders, each individual reflected on key benchmarks in their careers that profoundly impacted their leadership trajectory. While there were many experiences, decisions, and opportunities discussed as moments that helped to shape their path, each individual credited a specific person, specifically a coach, as the most important contributing factor to who they are as leaders today. Based on the reflections each leader shared about a coach they have worked with, it is clear the impact that these coaches had is both powerful and lasting. At Education Elements, we believe that if we build the capacity of key school roles, then teachers will be better supported to design, implement, and sustain innovation in their classrooms. In many schools and districts, innovative coaches are the key difference makers in developing struggling teachers into effective teachers, and good teachers into great teachers. Why do I choose to do this work? How would I describe my coaching philosophy? How do I model and encourage a growth mindset? How would the teachers I support describe our relationship? When and how have I celebrated risk-taking by others? How do I utilize questioning to learn and illuminate insights? How would others describe my tendencies during conversations? What habits do I utilize to reflect on conversations? What are my top strengths in content instruction and classroom culture knowledge and skills? What gaps are there in my content instruction and classroom culture knowledge and skills? What implications do these strengths and growth areas have on my current context and setting? How frequently and consistently do I provide both positive and critical feedback to each person I support? How do I know if my feedback is specific and actionable? How would others describe my feedback and the impact it has on their practice? What are all of the different ways I could provide learning and development opportunities for teachers I support? Which components of my coaching would each person I support say are the most effective? How can I differentiate the ways I support teachers to match the context, skills, and needs of each individual? What habits or systems do I have for clarifying and synthesizing information? Which method of communication would each person I support say is the most effective? Which methods of communication can I differentiate or improve to be more effective for the type of information I’m sharing and its recipient(s)? What percent of my time each day is spent working on tasks directly connected to my goals? What habits or systems do I utilize to proactively prioritize my time for what is most important? How can I be more strategic in prioritizing time, people, and resources to accomplish my goals? What things are of the greatest importance and/or interest for me to learn more about? What are all of the different learning and development opportunities I can seek? How can I consistently share my learnings, and encourage others to do the same? What habits or systems do I utilize to distribute resources and learning opportunities to teachers I support? How can I empower others to drive learning for themselves and their peers? What are all of the opportunities or structures, formal or informal, where I can increase collaboration between members of our school community? As you can see explicitly highlighted in our Coaching For Innovation Competencies Know Yourself and Cultivate Curiosity, we firmly believe that the habits of introspection and constant learning are crucial skills of highly effective coaches. By engaging in this reflection on your own coaching practice, you are already flexing many essential coaching muscles that will strengthen your ability to support innovative teaching and learning. 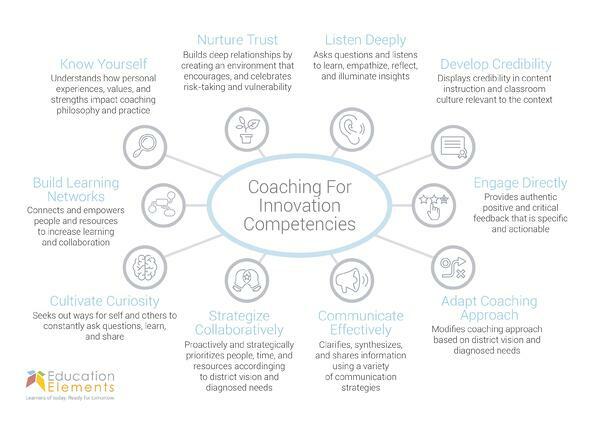 We encourage you to continue this learning by prioritizing the development of these 10 Coaching For Innovation Competencies in your own coaching practice, or the practice of leaders you support, as a key lever to constantly expanding the impact on teachers and students. Maggie Hodge is a Design Principal on the Design and Implementation Team. After working as a student teacher in college, she began her career in education as a Pre-K and Kindergarten teacher in New Orleans public schools. In addition to her role as a teacher, Maggie has served as an RTI chair, grade level leader, school leader, and district level leader in traditional public schools and charter schools in San Francisco, New Orleans, and Austin. 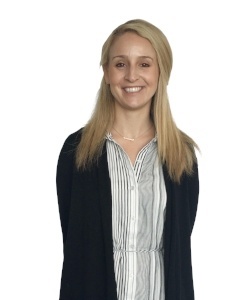 Maggie holds an M.Ed in Administration and Supervision, and pursues educational equity by focusing on school leader development, instructional coaching best practices, new teacher development, and innovative classroom design. In her spare time Maggie can be found in the yoga or spin studio, paddle boarding, or spending time with loved ones and her dog, Gizmo.